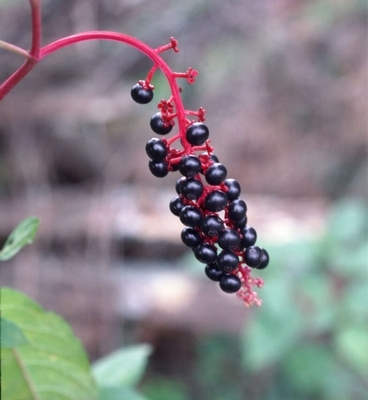 A large, 3 to 10 ft tall, perennial weed with thick, reddish-purple branched stems and dark purple to black berries. 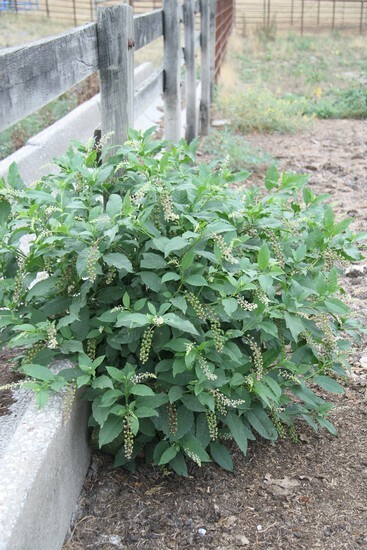 All parts of the plant are poisonous to cattle, horses, swine, and humans, especially the roots. 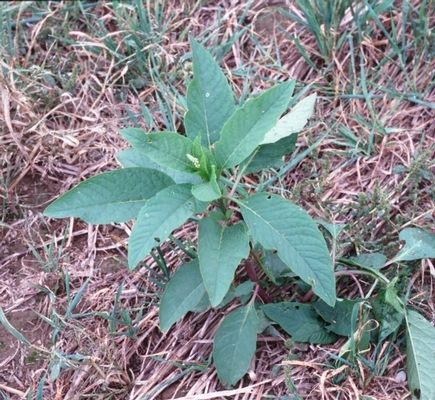 Leaves may be cooked to eliminate the poisonous components. Swine are most often affected since they are capable of "grubbing-up" the roots. Found from Maine to Iowa, and Kansas, southward to Texas and Florida and southern Arizona. 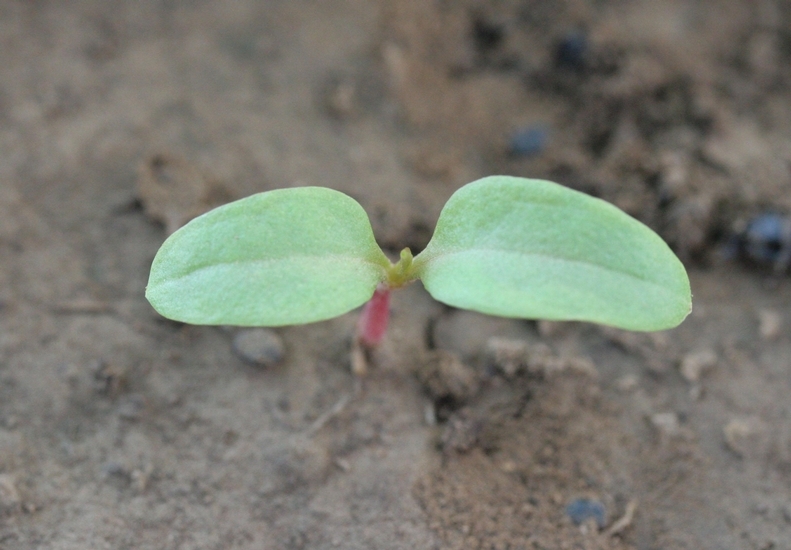 Cotyledons 7-33 mm long, 6-11 mm wide, egg-shaped but pointed at the apex. 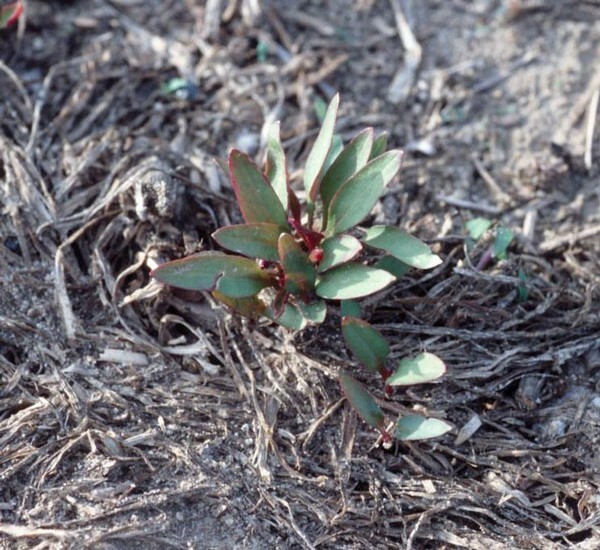 Stems below the cotyledons (hypocotyls) are without hairs, succulent, and often purple-tinged. 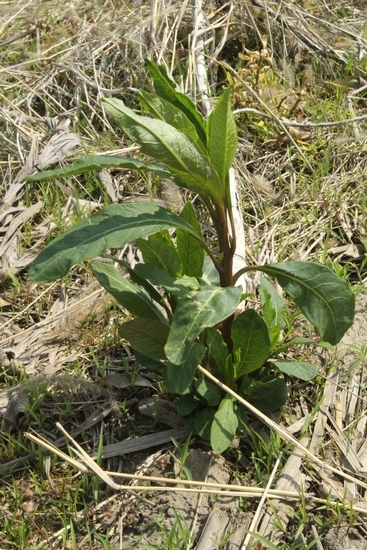 Young leaves alternate, egg-shaped but pointed at the apex, and without hairs. 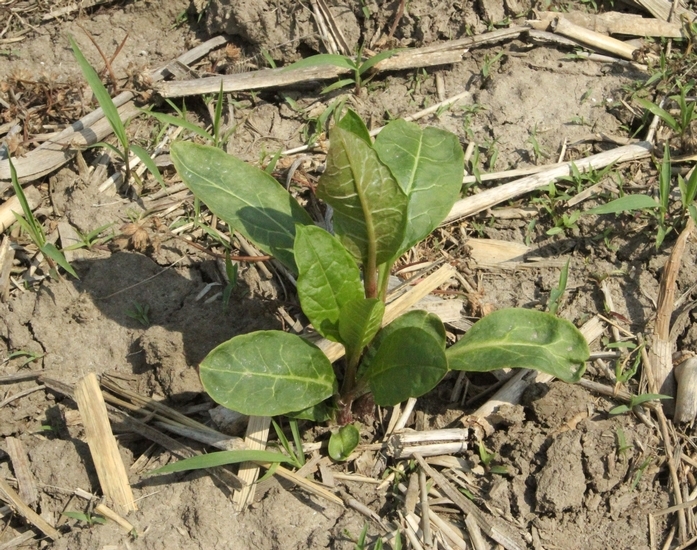 Cotyledons and young leaves are pale green in color, with reddish tinted petioles. 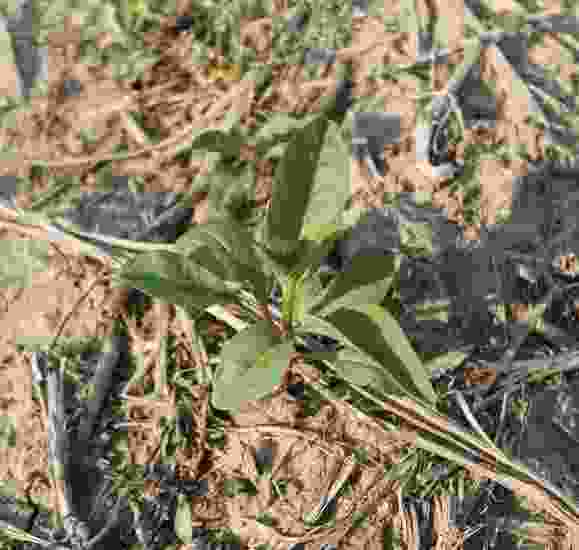 Alternate, 3 1/2-12 inches long, 1-4 inches wide, egg-shaped, petiolated, without hairs, and are smaller in size toward the top of the plant. 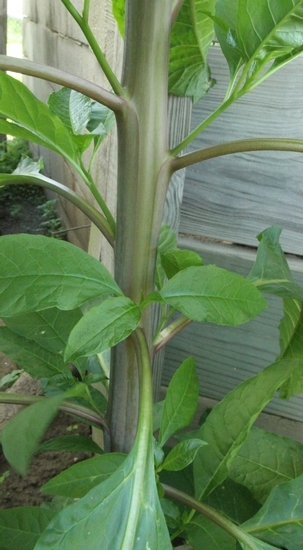 Branch from the root crown at the base of the plant, erect, large, smooth, purple-tinged. Individual flowers small (6 mm wide) with 5 white to pink-tinged sepals. 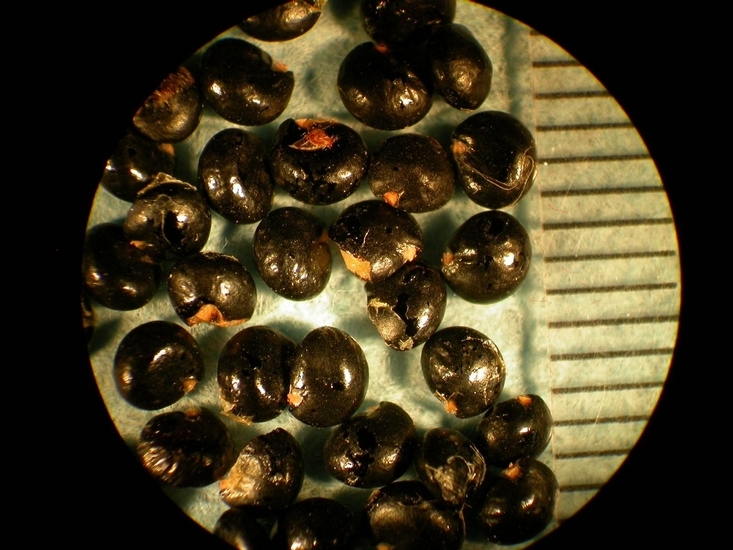 A berry, 7-12 mm, green when immature, dark-purple to black when mature. Contain a dark red juice. Large, white tap root up to 6 inches in diameter. 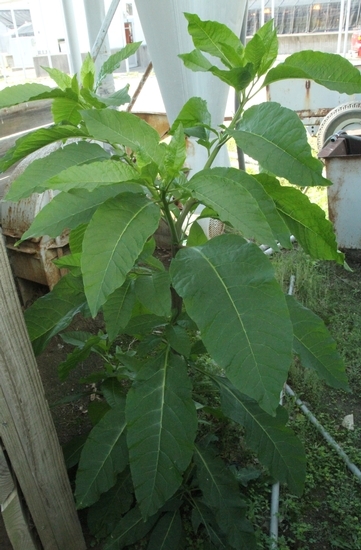 Large, tree-like plant with egg-shaped leaves, purple-tinged stems and dark purple berries.